More than 100 leaders representing 19 North Carolina electric cooperatives traveled to Washington, D.C., last week for the 2017 National Rural Electric Cooperative Association (NRECA) Legislative Conference. The group joined 2,000 others from electric co-ops across the country to meet with members of Congress and their staffs and advance key co-op issues. North Carolina co-op leaders sat down with senators Richard Burr and Thom Tillis, as well as each representative from the state’s 13 congressional districts, to discuss issues important to their members. 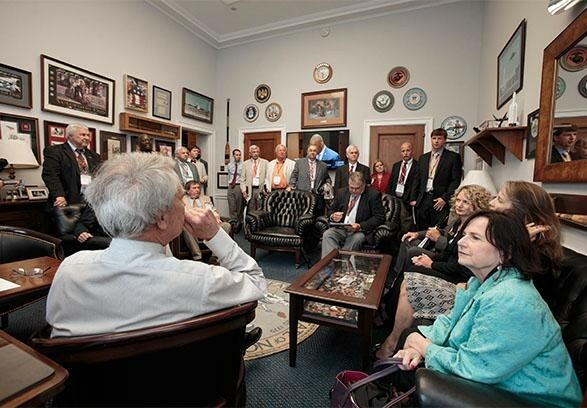 U.S. Rep. Walter Jones, Jr. (R-3) met with Edgecombe-Martin County Electric Membership Corporation, Cape Hatteras Electric Cooperative, Jones-Onslow Electric Membership Corporation, Tideland Electric Membership Corporation and Tri-County Electric Membership Corporation. For fiscal 2018, NRECA supports a $5.5 billion loan level for electric loans, with no language restrictions on use of the money. Co-ops also are encouraging Congress to fund the Guaranteed Underwriter Program at $1 billion and the Rural Economic Development Loan and Grant (REDLG) Program at $85 million for fiscal year 2018. North Carolina electric co-ops are national leaders in the use of REDLG funds and have channeled more than $50 million in funds to communities to date. Participants were asked to urge their representatives to sign on to H.R. 1090, the Technologies for Energy Security Act, which would extend tax credits for geothermal systems that expired at the end of 2016. Nuclear production tax credits are also a priority. S. 666, authored by Sen. Tim Scott, R-S.C., and H.R. 1551, sponsored by Rep. Tom Rice, R-S.C., would provide more equitable treatment of not-for-profits, like electric cooperatives, with a stake in nuclear power. Finally, co-ops support legislation to spur commercial deployment of carbon capture and storage technology. Several congressional leaders are developing legislation to reform the Endangered Species Act. Legislative Conference participants asked their elected officials to co-sponsor the legislation when it is introduced. Co-ops believe reform of the 1973 law is necessary because it impacts their ability to site and maintain power lines. Co-ops support efforts to make the law more efficient, effective and less costly. The Low Income Home Energy Assistance Program (LIHEAP) provides critical home heating and cooling help to millions of vulnerable American families, the majority of which are served by electric cooperatives. Co-ops support an appropriation of at least $3.39 billion in fiscal year 2018 funding for the program.